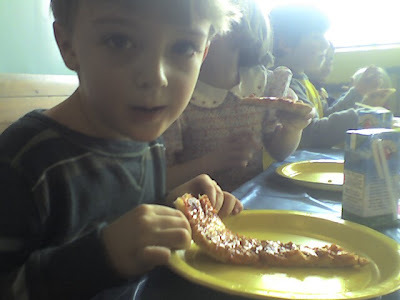 Izzy Eats: The art of raising a gourmand, one bite at a time: Eating Pizza: Ordinary For Some, Extraordinary For O. Eating Pizza: Ordinary For Some, Extraordinary For O. Today was a momentous occasion for Izzy's friend O... You must understand that O. has been on a dairy, gluten and wheat-free diet for nearly three years. Lately, much to my great pleasure, his parents have been loosening the restrictions, hoping for no ill effects. 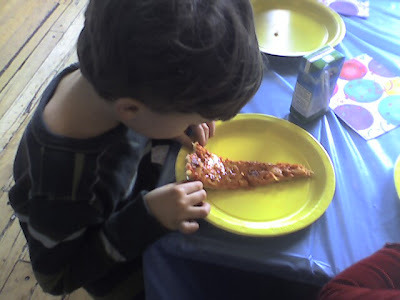 I was beside myself with joy to see O., at his very own birthday party, with a piece of pizza set before him. He seemed a tad bewildered and seemed to spend an inordinate amount of time nibbling gingerly at it. This is a boy who gobbles down cold ice cream in a flash so perhaps he realized the magnitude of the moment and was savoring his pizza, bit by bit. Not only did he have pizza but he also was able to indulge in an ordinary birthday cake. So far so good, no ill effects were noted. I am enthralled for so many reasons. For one, his mom will no longer have to stay up creating all manner of meals just for him, or have to agonize over what to prepare for his lunches. Best of all, it will be easier for O. to participate in parties and outings, without having to worry about what he can or cannot eat! Nevermind birthday, I want to throw an "O. Eats Wheat" party!